IMAGINE half the suburbs of Australia deserted; comfortable middle-class houses abandoned or burnt out; neighbours, their pets and cars nowhere to be seen. Think what life would be like if we were no longer able to enjoy our own prosperity, to work, to shop or send our children to school. That is the reality Syrians now face in a country that, until conflict erupted three years ago, took for granted such things as electricity, mobile phones, internet, TV, schools and medical care. In the three years since, more than 100,000 people have been killed, including 10,000 children. Inside Syria, more than nine million people urgently need humanitarian assistance. Out of the millions that have been forced to flee their homes, more than 6.5 million remain trapped inside the country’s borders. Another 2.5 million have managed to flee and are living as refugees in neighbouring countries such as Jordan, Lebanon and Turkey. Late last year we travelled to the region to see the human impact of the crisis and the important work our agencies — Oxfam and World Vision — are doing to support refugees from Syria in Jordan and Lebanon. We met refugees living in makeshift tents made of plastic sheeting and informal settlements in abandoned buildings — their “homes” surrounded by rubble and rubbish, with no running water or toilets. These were no places for anyone, let alone children. And yet we saw children everywhere, most unable to go to school and some working to try to give their families the merest of incomes. One man in Jordan dubbed the squalid environment he shared with his five children “a disease” in itself. One of his children had diabetes, another had a heart condition; neither had access to medical care. More than half a year later, the numbers of refugees are still growing and one thing is certain — the humanitarian assistance they are receiving is not enough to meet their needs and, at the most basic of levels, many must be going hungry for long periods. No matter how hard UN agencies, organisations like ours and governments in the region try to meet the demand, there is simply not enough funding to do our jobs properly. Without action to end the bloodshed and find a political solution to the crisis, the situation in Syria will become even worse over the coming months. 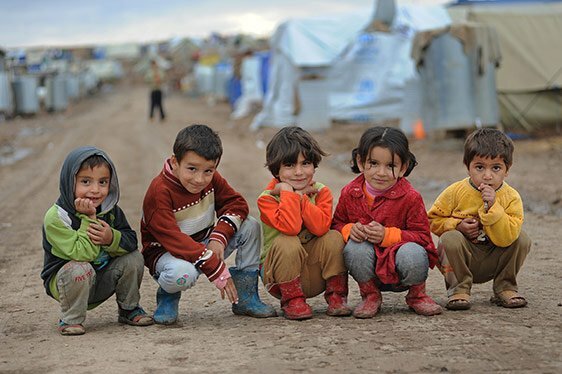 By December, the UN Refugee Agency projects that there will be four million Syrian refugees throughout the region. We cannot let this crisis go on for another year and Australia has a big role to play. Australia has already done a lot, playing a vital role on the UN Security Council to broker agreements to help improve aid access inside Syria. Just last month Australia co-authored a UN Security Council Resolution that was approved by all Security Council members. The unanimous resolution condemns widespread human rights abuses by the Syrian authorities and armed groups, calls for an end to all attacks against civilians and urges all parties to guarantee immediate humanitarian access to all people in need across the country. But this rare consensus urgently needs to be translated into action. Australia needs to continue to keep pressure on the international community to make sure parties to the conflict abide by the resolution, as there has been no real progress to date. Australia also needs to give its fair share of funding to the $6.5bn UN Syria Appeal, set up to assist those affected by the conflict. While Australia has been a generous donor in the past — we have committed $110 million in humanitarian assistance to the crisis since 2011 — this year the Australian Government has pledged only $10 million, a figure that suffers in comparison with other donors such as the UK, Ireland Kuwait and Denmark. Ultimately only a negotiated political solution can bring an end to the conflict. All parties with influence, including Australia, should be pressing the Government of Syria and opposition representatives to resume talks as soon as possible and allow a more central role in the next round of talks for women and civil society representatives. A sustainable peace will only be achieved if their voices are heard.